Uniontown, AL —(ENEWSPF)–April 12, 2016. Civil Rights Complainants today denounced Green Group Holdings, owners of the Arrowhead Landfill in Uniontown, Ala., for filing a lawsuit Wednesday targeting members of Black Belt Citizens Fighting for Health and Justice. Green Group Holdings’ lawsuit was filed in federal court in Mobile, Alabama. Uniontown is one of the lowest-income towns in the second-lowest-income county in Alabama. Black Belt Citizens is a community-based volunteer group fighting to protect the health of community residents living in the shadow of a mountain of coal ash dumped in Uniontown after the coal ash breached a dam in Kingston, Tennessee. Four million tons of coal ash were shipped by rail more than 300 miles to Uniontown, one of the poorest towns in the second-poorest county in Alabama. Green Group Holdings’ suit, which seeks $30 million in damages, seems calculated to intimidate and silence Uniontown residents who have exercised free speech to voice concerns about the effects of Arrowhead Landfill on their community. Many residents of the largely poor, African American community believe the Landfill has caused numerous harms to the people who live nearby, some of whom live only feet from a mountain of coal ash and garbage. In 2013, residents filed a civil rights complaint raising concerns about health problems, odor, dust, noise, flies, vultures, and other impacts of the Landfill on the enjoyment of their property. The complaint was filed with EPA’s Office of Civil Rights against the Alabama Department of Environmental Management (ADEM), which allows the Landfill to accept waste, including coal ash, from 33 states. 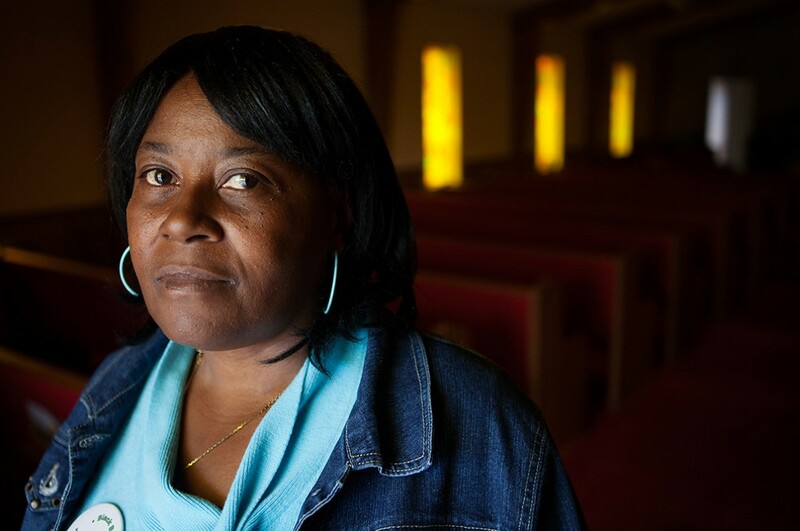 Chris Jordan-Bloch / Earthjustice –Esther Calhoun, at her church near Uniontown. The coal ash dump sits between Calhoun’s home and her church. “The lawsuit is flatly baseless and totally frivolous, being an effort to try to intimidate these citizens,” said Bill Dawson, one of the attorneys representing the individuals on the defamation charges. Earthjustice represents Uniontown community members in a 2013 Title VI Civil Rights Complaint to the Environmental Protection Agency alleging that the Alabama Department of Environmental Management (ADEM) reissued the Landfill’s permit without taking actions to avoid disproportionate adverse impacts on the basis of race, and despite the objections of Uniontown residents. High volumes of coal ash came to Uniontown following the largest coal ash spill in U.S. history, which sent a billion gallons of toxic waste across riverfront property in Kingston, Tennessee. Coal ash was sent from the predominantly white, middle class Kingston community to Uniontown, Alabama, which is 87% African American and has a per capita income of about $8,000. Uniontown is a classic example of a low-income community of color overburdened with an unfair share of environmental hazards, exactly what Title VI of the Civil Rights Act is designed to prevent. Coal ash is the toxic remnants of coal that is burned in power plants to generate electricity. It contains numerous toxins and carcinogens. For more, read A Toxic Inheritance, an Earthjustice feature story.